3 of 10" Transparent Standard Housing for Whole House Water Filtration System with 3/4" Inlet / Outlet Brass Ports (RA2-125-10) - is proper to use for reducing sediment, dirt, rust, & suspended particles in incoming water to you house. 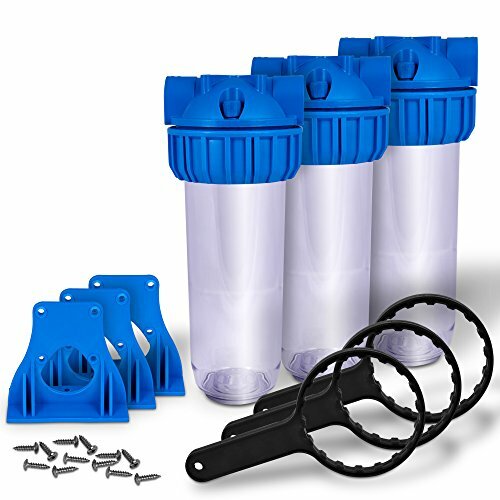 The transparent housing body is made of reinforced polypropylene for strength and resistance to chemicals, and the blue cap and ring are made of high-flow polypropylene for toughness. The blue cap has 3/4" inlet / outlet brass ports which allowed better sealed connections to the corresponding pipes. There is rubber O-ring on the top of the housing body to ensure a watertight seal. A pressure relief button on the inlet side of the cap releases pressure in the housing for changing filter cartridges. Those Housings for use in various applications and is usually placed in the main water line entering the house including, but not limited to residential drinking water filtration, food service, and irrigation. Easy to connect multiply housings in one Custom Whole House Water Filtration System to fit your specific needs.